The 90s: Another Decade In The History of the Greatest Broadcasting Organization In The World! 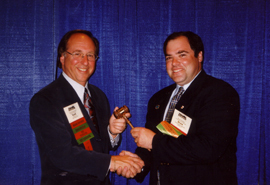 MAB Legal Hotlines, titled “the greatest MAB member service ever”, begins in September 1991. Commissioner James H. Quello is confirmed for another 5-year term on the FCC in June 1991. James H. Quello was named interim Chairman of the FCC by President Bill Clinton in 1993. He remains in that post for one-year until Reed Hunt is sworn in. “Baby Your Baby” campaign to reduce infant mortality kicks off in 1991 as a statewide Public Private Partnership Community affairs campaign including a partnership with TV, Radio, Print and Cable. As a result, calls to the state’s hotline increased 600% in the first year of the program. Cable providers and broadcasters cooperated in a service provided by MAB to identify commonly-owned syndication rights of stations and network nonduplication in a report faxed weekly to cable managers and TV members to make it easier for cable to block Syndex claims. MAB moved the NCSA program from “Yes Michigan” to the Department of Community Health, a more appropriate place for it according to Governor John Engler. During that time, while negotiating a new agreement, the MAB sat out one-year without NCSA funding, a hit of over $300,000! Stations battle Single Business Tax (SBT) and Advertising Tax at the State Capitol and debate indecency on the airwaves as well as keep tabs on children’s programming. MAB supports Desert Storm troops by donating sand pails with AM/FM weather resistant transistor radios titled “Project Musical Sand Pails”. 1992 – Mid-Winter Conference officially becomes the Great Lakes Broadcasting Conference & EXPO (GLBC). 1992 – MAB partners with Blue Cross Blue Shield with “Ask the Doctor” campaign. 1992 – The first “Shape Up Michigan” and “Shape Up Michigan Kids Club” campaigns took place featuring Isiah Thomas, Detroit Pistons’ guard and captain, and the MAB. 1992 – MAB offers warm hospitality to Michigan stations during a cold November evening in East Lansing as they cover the Bush, Clinton and Perot presidential debates. MAB celebrates its 45th Anniversary with a roast of FCC Chairman James H. Quello during the Annual Conference at Boyne Highlands, 1994. MAB creates the MAB Foundation in 1994 based on an understanding for the need of a continued human resource pool of educated people interested in entering the broadcasting industry and because the MAB had additional funds without a specific purpose. Over-reserving was something that the IRS, at the time, frowned upon. MAB formed the MAB Foundation to receive some of the reserves in hopes that it would grow to become financially sound & than if anything were to every happen to the MAB, the foundation might be able to take over some of the educational programming and services that MAB offered, continuing those things that fit their purpose. In celebration of the MAB’s 50th Anniversary, the On the Air! Michigan Radio and Television Broadcasting exhibit opens in the fall of 1998 at the Michigan Historical Museum in downtown Lansing with a Grand Gala event featuring Ernie Harwell. The exhibit covered the history of broadcasting in Michigan from 1920 to 2000. Also during the Grand Gala event, MAB issued framed certificates from Secretary of State Candace Miller to every station that turned 50 that same year. MAB ends a year-long celebration of its 50th Anniversary at the Grand Hotel in July 1999. Many past presidents, government officials and special guests joined in the celebration. MAB addresses Satellite Home Viewers Act (SHVA), Ownership rules and the beginning of the EEO rules. Past Presidents of the 1990s: P. Thomas Bryson, WJRT/Flint (‘89-’90); Thomas C. Griesdorn, WXYZ/Detroit (’90-’91); Robert F. Ottaway, WMMQ/Lansing (’91-’92); Patrick J. Mullen, WXMI/Grand Rapids (’92-’93); Philip C. Lamka, WDFN/WWWW/Detroit (’93-’94); Thomas Scanlan*, WGTU/WGTQ/Traverse City (’94-’95); Stephen C. Trivers, WQSN/WQLR/WKZO/Kalamazoo (’95-’96); Ross P. Woodstock, WLNS/Lansing (’96-’97); Bruce I. Goldsen, WKHM/WIBM/Jackson (’97-’98); Scott Blumenthal, WOOD/Grand Rapids (’98-’99). 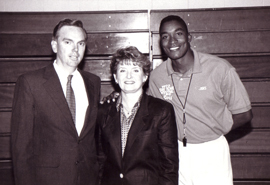 In the early 1990s, MAB partnered with the Isiah Thomas Foundation for Shape-Up Michigan, a statewide fitness campaign. 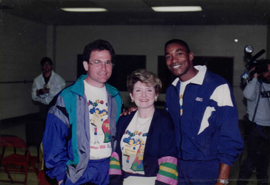 Pictured (l-r) Pat Mullen, MAB President 1993; Karole White, MAB; and Isiah Thomas. 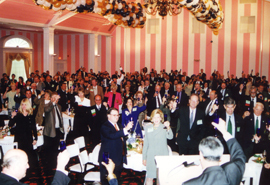 The official toast to the MAB’s 50th Anniversary at the Grand Hotel on Mackinac Island, September, 1999. 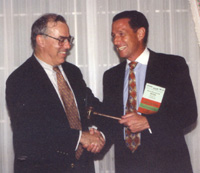 (right) Bruce Goldsen, MAB Chairman 1998 passes the gavel to Scott Blumenthal, MAB Chairman 1999. 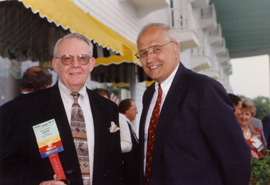 (l-r) Jerry Colvin, MAB President 1998 with Congressman John Dingell during the 1999 Annual Conference at the Grand Hotel. 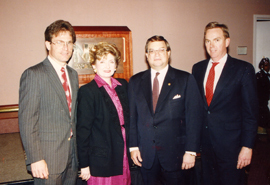 (l-r) Pat Mullen, MAB President 1993; Karole White, MAB; Eddie Fritts, NAB; and Bob Ottaway, MAB President 1992 during the 1992 State Leadership Conference. Going on a safari! 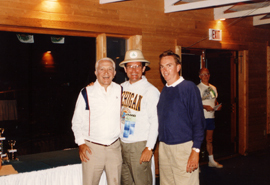 (l-r) James H. Quello, MAB President, 1959 and former FCC Commissioner; Patrick Mullen, MAB President 1993; Bob Ottaway, MAB President 1992; and Tom Scanlan, MAB President 1995 during the safari-themed 1992 Annual Conference. 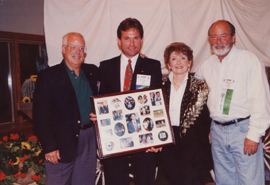 (l-r) Tom Scanlan, MAB President 1995; Pat Mullen, MAB President 1993; Karole White, MAB; and Phil Lamka, MAB President 1994 as Mullen is presented with the traditional photo collage given to each Immediate Past Chairman as they leave the officer seat. 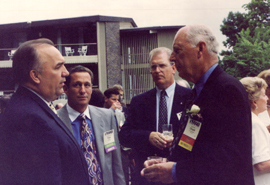 During a 1997 Annual Conference reception, (l-r) Governor John Engler; Ross Woodstock, MAB Chairman 1997; Wayne Foster, Seed-Roberts Insurance; and Chuck Fritz, MAB President 1967, discuss broadcasting issues. 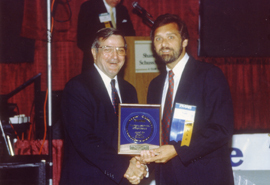 (right) Tom Griesdorn, MAB President 1991 presents Charles Mefford, MAB President 1989 with an award during the Annual Conference at Shanty Creek Resort. 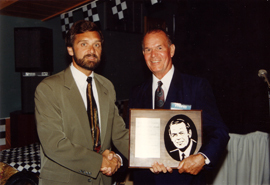 (l-r) Tom Griesdorn, MAB President 1991 presents Michael Lareau, MAB President 1966 with the Lifetime Achievement Award in 1991. 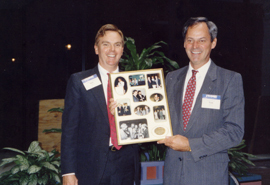 (l-r) Bob Ottaway, MAB President 1992 presents Tom Bryson, MAB President 1990 with the coveted Chairman’s Photo Collage. 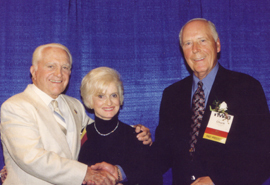 1997 Annual Conference (l-r) James H. Quello, MAB President 1959 and former FCC Commissioner; Barbara Fritz; and Charles D. Fritz, MAB President, 1967. 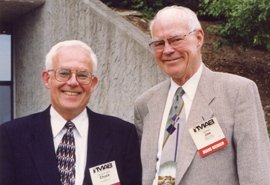 Enjoying the outdoors during the 1997 Annual Conference are (l-r) Charles Kelley, FCC and conference speaker; and Joe Blake, WMQT-FM/WZAM-AM (Marquette) and MAB board member. 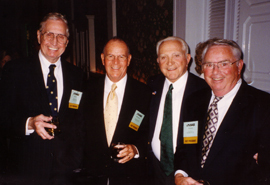 Celebrating the 50th Anniversary of the MAB in 1999 at the Grand Hotel at (l-r) John Anderson, MAB President 1973; Michael Lareau, MAB President 1966; James H. Quello, MAB President 1959 and former FCC Commissioner; and Peter Kizer, MAB President, 1974. 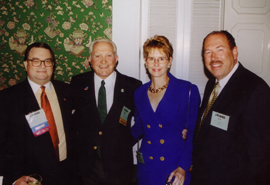 At the Grand Hotel in 1999 (l-r) Eddie Fritts, NAB; James H. Quello, MAB President 1959 and former FCC Commissioner; Victoria Liggett; and Bob Liggett, Liggett Broadcasting. In 1991 when Desert Storm began, MAB and its members came to the aide by distributing sand pails with portable radios to troops from Michigan. More than 300 AM/FM weather resistant transitor radios were distributed during “Operation Sand Pail.” Pictured (l-r): Bob Ottaway, MAB President 1992; Major General Vernon Andrews, Michigan National Guard; and Karole White, MAB Executive Director. 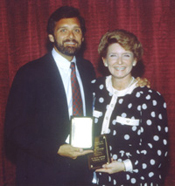 (l-r) Tom Griesdorn, MAB President 1991 and Karole White. The Early 90s: Random Thoughts from Deep Within the Memory Bag! To MAB…thanks for the invitation to look back, reflect and ponder the life and times of the MAB in the 1990’s. What I remember most vividly is joining the Board of Directors (“keeping my mouth shut”) and learning so much at the hands of my predecessors – Jim White, Guy Spitsberg, Jerry Colvin, Chuck Mefford and Tom Bryson…a smart thing to do. The late 80s and early 90’s brought two things to the MAB – Karole White and a permanent home in Lansing at 819 N. Washington Avenue. Photo right: Tom Griesdorn, MAB President 1991 and Karole White. First – I remember spending time (lots of time) on the phone with Tom Bryson discussing how to encourage Ms. White to continue in her position as Executive Director/President. The board was lucky enough to persuade her to move to Lansing and take over the role and she was establishing a name and reputation for the broadcasters of Michigan. Looking back – nice job, Mr. Bryson – as Karole is now celebrating 20+ years leading the organization…seems to have been a great “fit” for everyone involved. Second – upon becoming President in 1991, I remember burning up the asphalt between Southfield and Lansing meeting with Karole to look over, investigate, plan review and finally – sign a mortgage on a permanent home for the MAB. Karole, remember how one second in almost every meeting we felt as if we were taking a giant step to solidify the future of the organization—only to be followed by a tick of the clock and being filled with fear that we were over-extending our capabilities and insuring certain ‘doom’ to the MAB and our respective careers? January marked the swearing in of the 45th Governor of the State of Michigan, John Engler, who took over the reins from Jim Blanchard – a shift from Democratic to Republican control was causing many changes in Lansing. Karole – remember the challenge of “re-establishing” a dues structure to support the NCSA program in order to comply with the rules of the IRS? Look around the board table – those directors who would go on to accomplish so much in our industry…Bob Ottaway, Pat Mullen, Elaine Baker, Tom Scanlan, Steve Trivers, Alan Frank, Scott Blumenthal (only a few in name). What is this new industry “cable television” – how do you think this will play out in the future? Do you think it will have an effect on over-the-air television? Man, we have enough competition in our TV markets with three networks and those independents. …all good times and today as I sit as Vice President of the OAB (Ohio Association of Broadcasters), I will assume the presidency next year, and have the privilege of doing it all over again 19 years later in my home state, here in Columbus – near my beloved “OSU Buckeyes” (Sorry…had to do it!). Tim Griesdorn’s comments originally appeared in the May, 2009 issue of the MAB E-Newsletter. 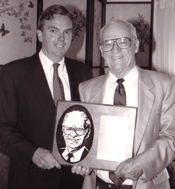 (left) Bob Ottaway, MAB President 1992 presenting Ernie Harwell the 1992 Lifetime Achievement Award. I think that it might have been Chuck Mefford who encouraged me to join the MAB while I was still broadcasting WMMQ-FM out of our original Charlotte studios. It was one of the best things that I ever did in my professional career. The people, the information, the lobbying…what great years. Although times are tough now, we thought that they were tough then too. I remember at one of my first meetings when Tom Griesdorn announced that they had had MAB headquarters appraised and that we may need to sell it and rent it back! That caused a few jaws to drop. And, I had fond memories a few weeks ago when my client Macomb Community College invited me to attend a celebration of their Sixties Exhibit followed by an evening with the Smothers Brothers Live. You can imagine my surprise to see a video clip of Pat Paulsen, whom we saw live in Traverse City at one of our summer meetings, on the big projection screen “running for President” and espousing a platform to rid the country of greed, end the Middle East conflict and get the economy under control among other things. Can you believe it? And, this was before CBS cancelled their program in April 1969! More proof that…”the more things change, the more they stay the same. My best wishes to all of my fine MAB friends! The best IS yet to come. Bob Ottaway’s comments originally appeared in the May, 2009 issue of the MAB E-Newsletter. I’ll never regret getting “drafted” as GLBC chairman as it gave me a wonderful opportunity to work with the talented MAB staff and meet many broadcasting colleagues from around the state. It also gave me a deeper appreciation of how blessed the broadcasting industry in Michigan has been to have an association that consistently provides the finest broadcast training and programming services in the country. Without question, the best part of being part of the MAB board was getting to know so many outstanding individuals who have been leaders of the broadcasting industry in our state. I would have never known many of those people had it not been for my association with MAB. Many remain friends to this day. The broadcasting industry provided me with a lot of wonderful opportunities and memories. MAB allowed me the privilege of making a small contribution back to that industry. Thank you! Ross Woostock’s comments originally appeared in the May, 2009 issue of the MAB E-Newsletter.